There have been protests in Lancashire and Balcombe in West Sussex which were against the initial investigations and not even to actually set up wells. Caudriila have since announced that they will not actually be carrying out any drilling for shale gas in Balcombe either now or in the future. 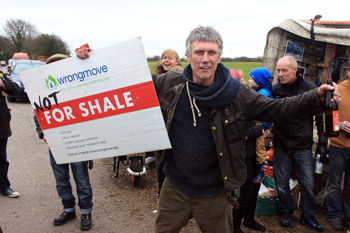 The usual groups you would expect to oppose fracking such as The Green Party, Greenpeace, Friends of the Earth along with some relatively new organisations such as Frack Off, Frack Free Greater Manchester and even support from John Robb’s Louder Than War website which essentially a music website. Living close to the site I was also a bit surprised at the number of semi detached houses that had ‘Frack Off’ posters displayed in their windows although I suspect that these are the same people who object to Peel Holdings releasing land for development sites for new houses. For many people I spoke to about the issue of fracking, it appeared to be self evident that we should be opposed to fracking because it must be bad to pump chemicals into the ground, and feared that there would be consequences in the future. Not to mention the additional traffic, house prices and the disruption to the land. If we go to the Caudrilla website there is explanation about the process of fracking which began in Kansas in America in 1947 and now there have been 2.5 million ‘treatments’ that have taken place globally. Essentially fracking is the process of releasing fluid (99.95% water and sand with some chemicals, see below) at pressure into the ground to depths of around 6000ft. 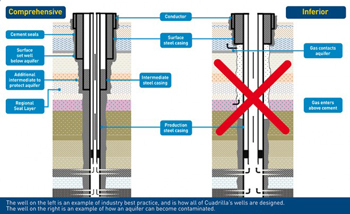 This creates cracks in the rocks which allow gases such as shale gas, Cold Bed Methane (CBM) and Underground Coal Gasification (UCG) to be recovered for energy production. The chemicals used in fracking include polyacrylamide (friction reducer), Sodium salt (for tracing fracturing fluid), Hydrochloric acid (diluted with water) and Glutaradehyde biocide (used to cleanse water and remove bacteria). Many chemical names appear scary but everything is made up of chemical elements such as water H20 or Dihydrogen Monoxide which far from harmful is necessary to facilitate life. Many protestors may suggest that the fracking method is just another method of retrieving fossil fuel which causes CO2 omissions, leading to climate change but recent data suggest that mean global temperatures have actually stabilised over the last 10 – 15 years. We need energy to facilitate our lifestyles, keep us warm and mobile, provide power to the schools, hospitals, businesses and manufacturing plants and fracking seems to be worth exploring to obtain that energy. If it really was that carbon dioxide was the problem you would expect that they would be supportive of nuclear power but I suspect that they would find that even more horrific. It may be that their real problem is with people who use too much energy and should restrain their consumption and live simpler lives. Frack Free Greater Manchester speak on behalf of people of Manchester but this is quiet presumptuous as I am not aware of anyone who has been asked for an opinion by this group or who has elected them to such a position. 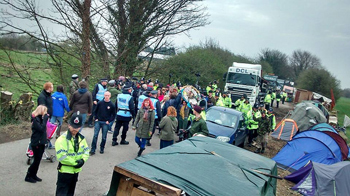 There are two aspects of the anti fracking protest that I would take issue with, the first is the risk aversion and the embracing of the precautionary principle, and the second is the subordination of human ambition by deference to nature. Information provided by the protestors as their reasons to object to fracking include the threat to agriculture, recreation, tourism, peace of mind and property values. They accuse the energy companies of being greedy and exploitative. Perhaps they are really anti-capitalist protestors but to use fracking in such an opportunist way is just lazy and opportunist. To provide information and guard against irreversible damage and pollution of the planet. To guard against misinformation and political agendas which benefit the minority of people. To protect our land, air and water from pollution and challenge ecocidal policy for the planet on which our grandchildren will inhabit. It sounds a very noble cause but actually the language of these protest groups serves to obscure a rational and scientific viewpoint with its emphasis on uncertainty and an apocalyptic fear filled view of the future. A rational view could surely appreciate that human knowledge and scientific understanding through experimentation can lead to a future of bountiful energy supply, economic growth and prosperity so that our children can live in a world which is more comfortable and pleasurable and explore more of this world with increased mobility. Through history and more recently the industrial revolution progress was never guaranteed but it meant taking risks which sometimes would lead to discoveries and sometimes would lead to failure. Taking risks has enabled the overcoming of natural limits with the building of bridges, roads, tall buildings, aeroplanes and rockets. In recent years there has been a shift towards eliminating risk such that unless any potential dangers can be eliminated then the activity should be postponed. Of course we should not advocate taking unnecessary risks and make the search for new materials and products as safe as possible, but risk aversion really has had a paralysing effect on innovation. An example of this may be seen in medicine where new drugs are not marketed until they have been tried for years when they could be bringing health benefits in the short term. There is a perception that big businesses will conceal risks in their enthusiastic rush to make a quick return on profit but, if anything, there is an over cautiousness which is holding progress back and denying us the potential returns. The elevation of nature over recent years is also a barrier to progress. The onwards march of the environmental movement has led to an uncritical acceptance of the canon of sustainability where human activity is seen as having a negative effect rather than a civilising purpose. We should remember that it is human ingenuity that has allowed us to defy gravity in construction and transport systems, to defy disease with medical advances. Human ingenuity has allowed the development of cities and to understand and discuss intellectual concepts. The moon landing in 1969 is a great example of what can be achieved if there is the political will. Surely any obstacles can be overcome in the pursuit of a new method of acquiring energy, especially in such an over regulated industry. It is the mantras of caution, restraint and risk aversion which are holding back innovation. There is nothing remotely radical about being anti-fracking. We do need more discussion and debate and to understand what is involved with new processes but to base a protest campaign on the desperate notions of appealing to fear and mistrust is not the way forward.